Light Up My Night is a Duel minigame in Mario Party 6. It may be a pun the romantic phrase "You light up my life!". 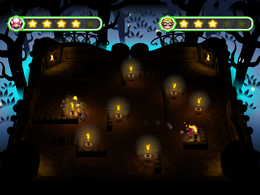 In the introduction, it shows both players lighting their torches, focusing on the first player. It then zooms out. Each player has a torch that is lit. There are unlit candles scattered along the maze of the board. The way for one player to beat the other is to light five candles first. The player would press when in front of a candle to light it. Rules – "Scramble through the dark maze to find candles and set them ablaze! Whoever lights five candles first wins!" Advice – "The candle locations and stage layouts change each time you play." This page was last edited on October 31, 2018, at 11:59.